The Marks family was renovating their Manhattan loft and wanted something special for their son's bedroom. 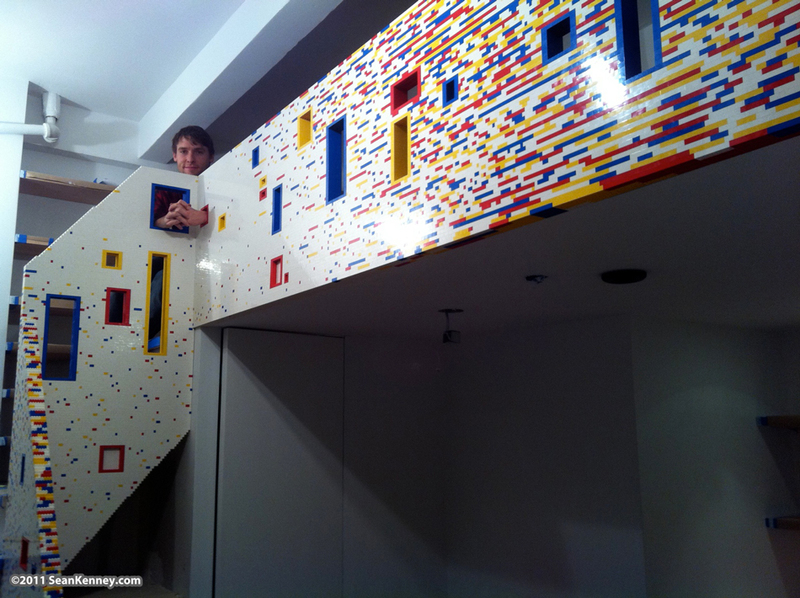 Being that their son was a complete LEGO maniac, they opted to surprise him with a one-of-a-kind built-in sleeping loft created with zillions of colorful LEGO pieces! The homeowners were overjoyed with the end result and were excited to move back in when the construction was done. The homeowners surprised their son by bringing him by to meet us about halfway through the project. He was utterly speechless! Can you imagine walking into your bedroom and seeing something like this? To celebrate, he put one unique piece into the structure that only we (and he) know how to spot! We approached the visual design as a free-form process, designing color patterns, shapes, and densities together with the homeowners as we went. They were very involved in the creative process and would excitedly gesture about, providing direction as the LEGO sculpture grew, "more stretchy marks, and little clumps make their way and gather over here, but not blotchy, just clumpy!". It was completely awesome to work with creative direction of this manner while then leaving myself to be the vessel for their vision. Constructing the staircase was quite a physical challenge. Building upwards row-by-row, we needed to have a plan for how things would come together before we got there, and to envision what the areas would look like before they were done. The loft was conceived by the project architect and the underlying structure of steel and wood was constructed by the general contractors. It was my job to clad the entire structure with LEGO pieces. This was doubly-complicated by the fact that nearly none of the sculpture rests on the ground! We built upwards over thin air, 10 feet up,?making sure every piece was perfectly straight and aligned with the steel and wood beams. And since we glued every piece into place as we went, there was no room to make mistakes! All in all, the sculpture took two weeks of full-time work to build, together with my assistants Geoffrey and Jung Ah.